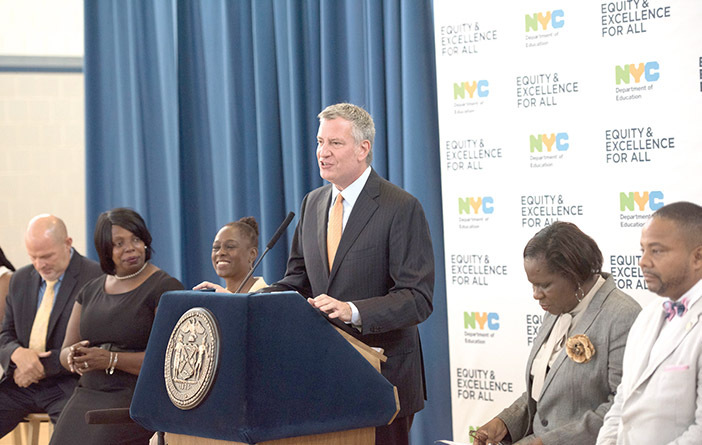 Mayor de Blasio noted that this year Equity and Excellence initiatives will reach more than 800 City schools. Equity and Excellence take front and center stage this year—the first full school year implementing the initiative since its formal introduction last September. The targeted goal of the initiative is to support progress across all schools so that, by 2026, 80 percent of students graduate high school on time, two-thirds of graduates are college-ready, and all students are reading in 2nd grade. These commitments build on critical administration initiatives including Pre-K for All, which provides every 4-year-old in the City with a free, full-day, high-quality pre-K seat, and the 130 Community Schools, which bring schools, families and communities together as partners to provide wrap-around services that increase opportunities and eliminate barriers to learning for underserved students. In addition progress is slated to build in New York City schools across multiple measures: a graduation rate over 70 percent for the first time that puts the City on track to reach its 80 percent goal, the lowest-ever dropout rate, and the highest-ever rate of students enrolling in college. “With the investments we are making as part of our Equity and Excellence agenda, we are shaking the foundation of our education system,” said Mayor Bill de Blasio. Through Universal Literacy, every school will receive support from a dedicated reading coach who will work with teachers to ensure all students are reading on grade level by the end of 2nd grade. Through Algebra for All, by 2022, every student will have access to Algebra in 8th grade, complete Algebra no later than 9th grade, and there will be academic supports in place in elementary and middle school to build greater Algebra readiness. AP for All is adding Advanced Placement courses at underserved schools across the City; by fall 2021, students at all high schools will have access to at least five AP classes. Through Computer Science for All, every student will receive computer science education in elementary, middle, and high school by 2025. Through College Access for All – Middle School, by the 2018-19 school year, every middle school student will have the opportunity to visit a college campus. Through College Access for All – High School, by the 2018-19 school year, every student will have the resources and supports at their high school to graduate with an individual college and career plan. District-Charter Partnerships will pair district and charter schools to foster strong relationship and share best practices. Partnerships include facilitated conversations among schools, organized visits, and sharing of resources and strategies. Pre-K for All is in its second year of providing a free, full-day, high-quality pre-K seat for every four-year-old in New York City – better preparing our youngest students to learn and be successful in kindergarten and beyond. New York City’s 130 Community Schools recognize that in order for students to achieve academic excellence, we must support the whole child, as well as their family. Community Schools support students, engage families, and strengthen communities from all sides; integrating academics, health, youth development, and family engagement and providing access to critical programs and services like vision screening, mentoring, expanded learning programs, adult education, and mental health counseling. Each school is paired with a lead Community Based Organization partner that works collaboratively with the principal and the school community to do this work. “Anything is possible in the new school year, and that’s even more the case with our reforms to increase equity and excellence for all students. From improving reading instruction for our youngest learners through Universal Literacy, to putting our students on the path to college success through College Access for All – High School, these initiatives are going to make a real impact for students and families. I welcome back our students, families, and educators, and am excited about the work ahead,” said Schools Chancellor Carmen Fariña.